Engineering work in process (WIP) is notoriously difficult to manage because unlike manufacturing WIP you can’t see it. Engineering WIP is information in various forms along the engineering value stream. Value is added to each ‘engineering work item’ at each successive stage up to customer delivery (either internal or external customers). The key goals are managing effectiveness and efficiency of engineering work. Typically management sees input requests and outputs that are often late and overrun but have trouble seeing the causes in-process. Management could take corrective action if they could see engineering in-process WIP more clearly. To visualize engineering WIP firms need to establish a simple system to identify ‘in-process engineering work items’ appropriate for each stage of their engineering value stream. These work items act as a proxies for physical items that would be visible in a manufacturing process for instance. Engineering work often varies in size, complexity, and novelty so a simple (ie. small-medium-big, low-medium-high, proven-modified-novel) rating system should also be used to differentiate the scope & nature of each work item without getting too confusing. Post-it notes or total work item counts by size, complexity, or novelty identifiers are marked on a white board and updated weekly or at the operating cadence selected for the firm. Managers should distinguish between engineering work items that are ‘active‘ or ‘waiting in queue’. This distinction is critical to see queues, evaluate throughput, and identify capacity bottlenecks in the engineering value stream. The visual WIP flow board allows managers to see engineering WIP in-process and understand the dynamics of their resource allocation performance. All engineering managers have experienced the effects of queues but often can’t pin-point them with sufficient visibility in any given week to take effective action. Queues begin to form in any stage as capacity utilization increases beyond about 75-80% based on queuing theory (see Reinertsen for an in-depth explanation of why this is so). For example the production support stage in this example. Queues introduce congestion in the engineering work flow that causes delays that can lead to schedule overruns and idle engineers waiting for data in downstream stages. Queues in earlier stages are more dangerous for engineering delivery performance. The queue size – capacity utilization curve also helps to illustrate why maximizing capacity utilization in engineering is bad for schedule performance because in-process queue formation will choke flow. Most firms today are multi-project organized by matrix so choked flow and congestion can have serious negative consequences from complex inter-project connections. The visual WIP flow board helps management to make the paradigm shift from the traditional ‘maximize utilization‘ paradigm to ‘maximize throughput’ paradigm of lean engineering. Probably the single biggest benefit of the visual WIP flow board is being able to see queues forming before they reach choke flow in order to take timely action. This is also why the visual WIP flow board should be updated weekly at a minimum to capture the dynamics of work flow in engineering. To maintain streamlined flow , maximize engineering work efficiency, and avoid congestion/choked flow the amount of WIP in each stage of the engineering value stream should be actively managed. This is accomplished by applying WIP capacity constraints at each stage of the engineering value stream. 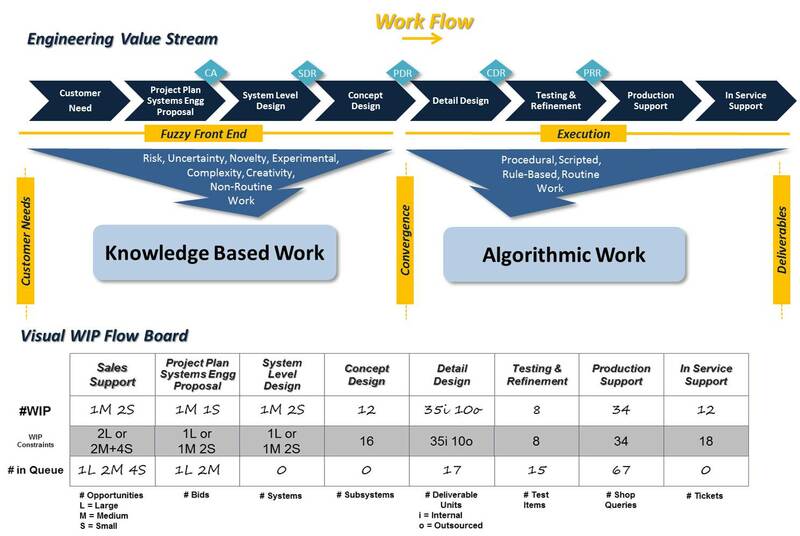 For example the capacity constraints are defined in the shaded middle row of the visual WIP flow board for each stage of the engineering value stream. WIP capacity constraints enable engineering managers to control the throughput in engineering. The visual WIP flow board helps to visualize the flow on a day-to-day basis enabling more effective control actions. When combined with small batch sizes WIP capacity constraints are powerful management control methods. Engineering managers can adjust and set the optimum WIP capacity constraints as they gain experience with the visual tool in practice. Work Acceptance Discipline – This is the most critical lever because WIP constraints at the initial stages can ‘throttle‘ the work flow in down stream processes. If too much work is accepted in a short period of time the work the visual WIP flow board illustrates how streamlined flow would become rapidly choked and slow progress along the value stream with waves of underutilization at later stages. By applying ‘go/hold discipline’ management can set engineering up for success along the engineering value stream. Resource Allocation – The visual WIP flow board also helps to see how engineering resources should be allocated to deliver value at each stage. The visual tool inherently allows multi-projects but rather than giving a project view gives a resource view to clearly see capacity constraints for faster resolutions. Resource Organization – The visual WIP flow board provides insight into how engineering resources should be organized to maintain streamlined flow. The value stream model provides an alternate view of the functional-project ownership problem that many organizations get caught in. Firms may have several business lines that possess separate value streams so managers can identify bottlenecks and allocate resource capacity more effectively to each value stream rather than function or too many projects. 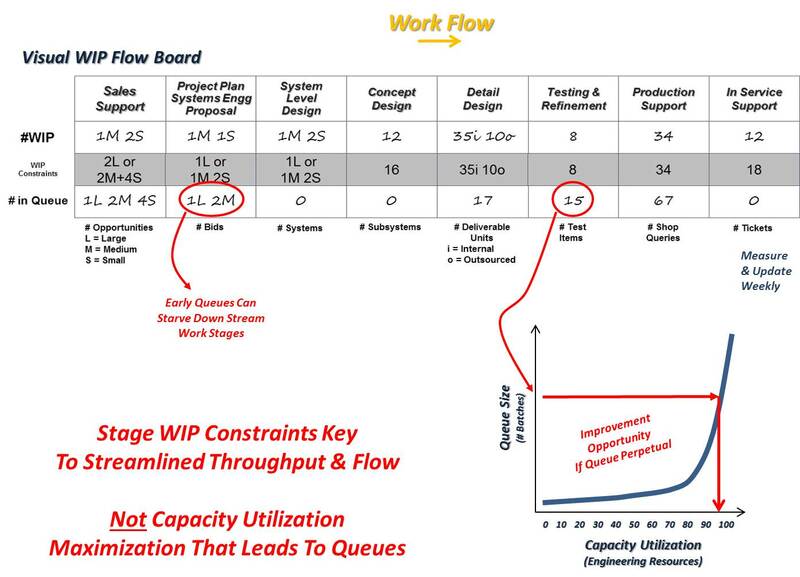 Allocating Spare Capacity – Engineering resources that are underutilized will be immediately clear from the visual WIP flow board enabling engineering managers to reallocate their time for short periods to work down queues in other stages. Developing flexible resources is key. Some specialist engineers may be more difficult to move but the visual board helps staff to see how their flexibility will help contribute to the firm business performance but also make their work day less stressful. Targeting Outsourcing / Subcontractors – Stages with perpetual queues are opportunities to target outsourcing or subcontractor efforts. The added overhead and lead time for outsourcing is not appropriate for short term queues and will not be responsive enough to maintain streamlined flow. Engineering Process Improvements – Stages with perpetual queues are also ideal opportunities to target engineering process improvements. Adjusting To Seasonal / Cyclical Variation – By tracking and recording engineering throughput data collected with the visual WIP flow board on a weekly tempo over an annual period management can build better insight into seasonal and cyclical variation. This insight can be useful to resource capacity actions, work acceptance decisions, and outsourcing decisions. All firms experience some form of seasonal work volume effects so the visual WIP flow board can be used to manage short term surges at peak work volumes or scheduling long term development activities during slow periods. Efficient Buffers For Variance & Uncertainty – High task duration variance caused by uncertainty during the ‘fuzzy front end’ of the engineering value stream is key operational difference from manufacturing value streams. Although active risk management and risk reduction methods can be applied to reduce the variation eliminating it outright is not possible nor desirable because it inhibits innovation a key source of value creation. The visual WIP flow board enables engineering management to intentionally build-in capacity buffers to increase throughput. Business Line Value Streams – As firm’s grow and support multiple business lines separate visual WIP flow boards can be established to support resource allocation across the multiple business lines to enable prioritization, de-confliction, and possibly even exploiting differing seasonal cycles for efficiency. Combined together the visual WIP flow board and active WIP management can dramatically improve engineering efficiency and effectiveness. The improved control realized by such a method can dramatically improve project on-time and on-budget outcomes. Strategically the visual WIP flow board can also help management to make wise resource investments, partnering decisions, and strategic pivots to fuel growth. Experience with the visual WIP flow board provides management a better feel of how to size and allocate new engineering resources if the firm is growing rapidly. The mix of experience and inexperience can be targeted to stages that present the biggest bottlenecks to growth. Alopex Management Consulting can assist you to implement more effective engineering WIP management for improved business outcomes. This entry was posted in Engineering Delivery, Engineering Productivity, Lean Engineering on September 13, 2013 by Andrew Reif.